This is about my Previa and 3rd gen Sienna. 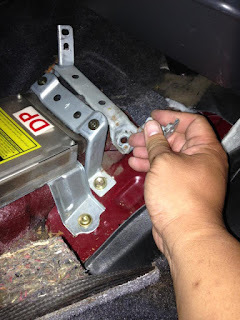 Parts and Ideas, rants and fixes.. Just documenting the process of these vans. 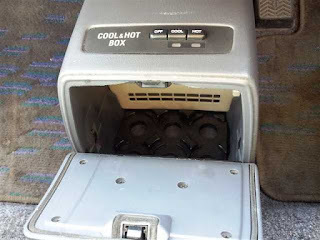 I found out that the previa had a "cool box", which is like tiny fridge under the dash in the middle, from Toyotavantech. I have seen them only in photos and in Canadian spec previas (unsure if they were in US spec). 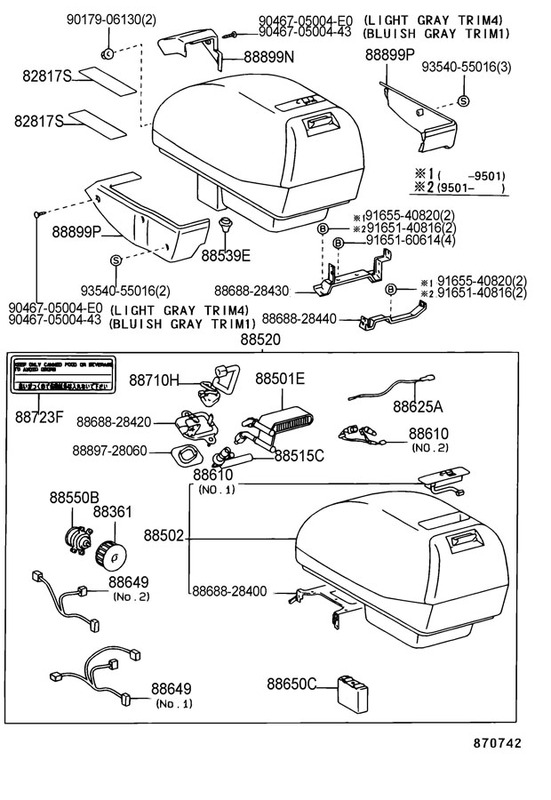 Even our owner's manual has some mention of them. Often times, I would look at CL in Vancouver BC in hopes someone wants to sell or part a van with it. Now, I've seen a few different versions, in which I don't have the ones that are pictured below. (note, these cool box images were found on the internet). I've kinda looked at the cool box as a Holy Grail. After volunteering my morning at the farmer's market making boxes and putting fruits and vegetables for low income families (Phat Beets Produce!) here in Oakland, I went to go fill up gas in Hayward. It was 4:30 and I didn't know if I should go back to SF or stay in the area. I wanted to go to the junkyard to look at previa stuff, but wasn't sure as it wasn't much time before they closed. For some reason, I decided to go. I got there at 4:45 knowing they close at 6. Paid my $2 to get in and started looking for previas down the Japanese van/suv aisle. The first previa wasn't anything. I got the cup holder locking piece that always breaks just to get my $2 worth. I then came upon another previa, with a bra on it. 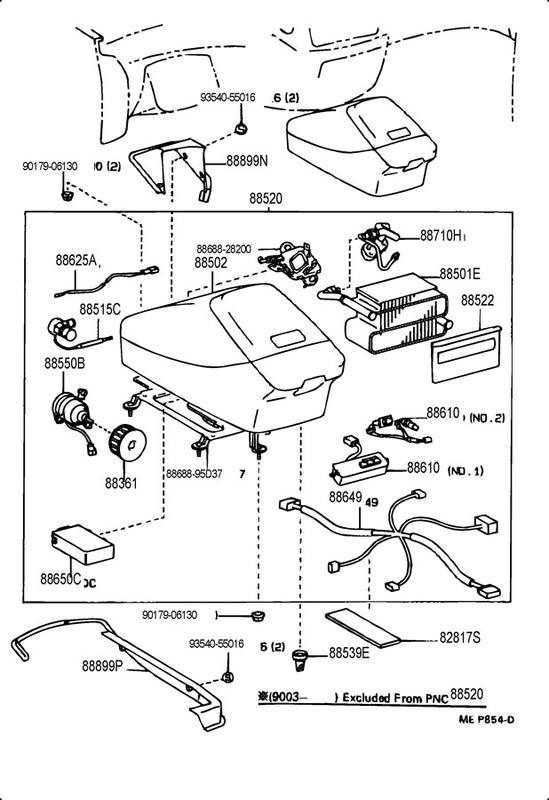 Thought about taking the bra since it was OEM toyota. Opened the sliding door, just to peak in, nothing. 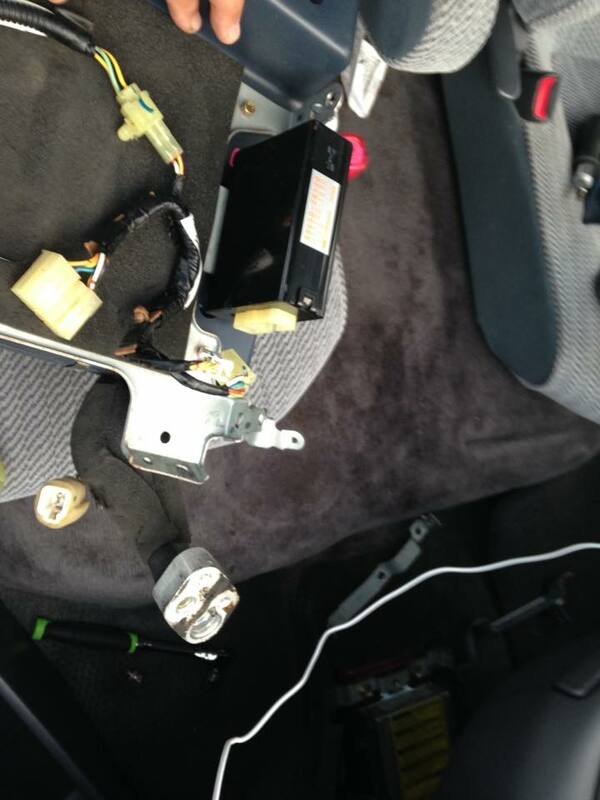 Opened the passenger side door and looked at the dash. My heart immediately started to race!!! A cool box!!!!!!!!!!!!!!!! I could not believe it! I ran back out to my van and got my sockets and screwdrivers. I then started to just take off everything. I got the cool box out, then got the brackets and the back and right sided bottom covers. The left/driver side was missing, but found it in the back seat, kinda bent from the previous person possibly pulling on it. 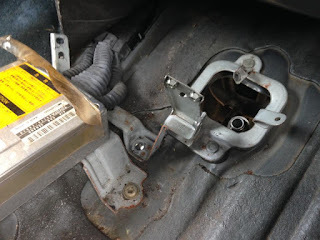 I had to go underneath the van and undo 2 10 bolts that were attached to the coolant lines (pictures below). Got everything and took off a seat cover to wrap and carry it to the front. When I was paying, I said it was a center console piece, which it was. Picked it up for $5.99 and $3.99 x2 for the cover pieces. I took some video after I got the cool box back to my van as they were closing up. I returned in the morning to get the coolant lines. First thing, there is a hole in the floor pan as seen here. This is where the coolant lines go to. There was a rubber gasket and this bracket . This was the video I took, but I did not get the picture, so I screen shot it. In front of the computer box is a rubber grommet. That is a drain. The cool box drains through it. After taking off my console piece (tray), this is where you see the differences. 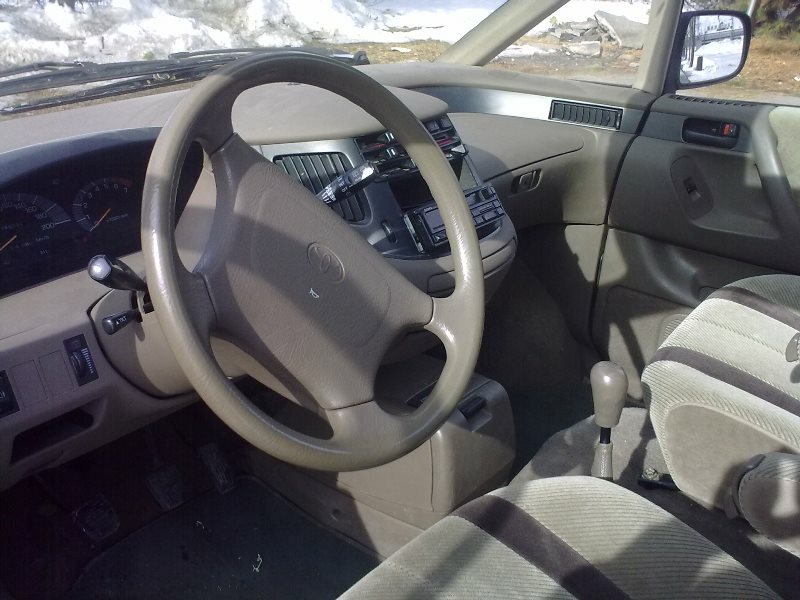 Just as I suspected, the previa is not universal like many other cars. 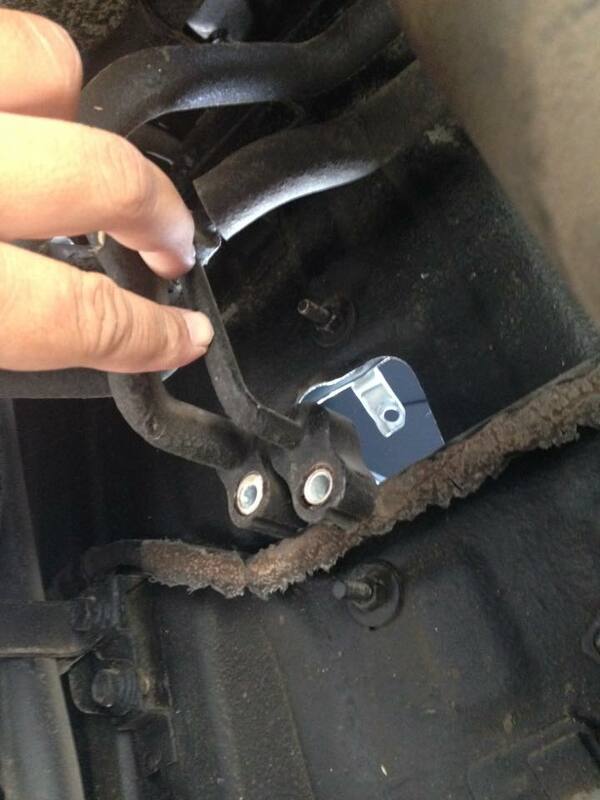 Where the hole for the coolant lines are, I don't have a hole nor is it a cover. The Previa has many different chassis set ups and they are not universal. 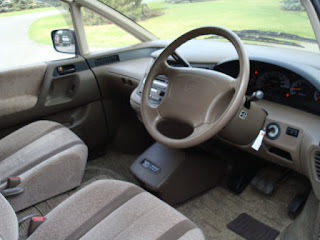 I suspected this because when I was looking for a previa, I was looking for capt chairs and thought that the bench style seats could also be placed if I changed my mind. That was not the case. So not all previas are universal. This is the bottom of the cool box, there is a black box and a few plugs besides the coolant lines. I had to cut up very high as the harness went into the dash. The front and back brackets were different. 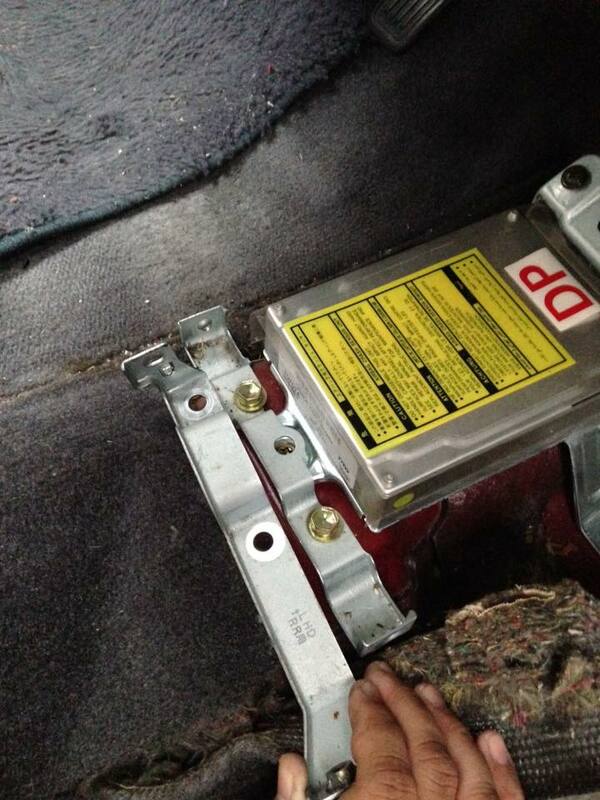 But a straight bolt on replacement. The brackets even had an arrow pointing, so you know which direction to place them. Coolant lines from underneath the previa it came off of. 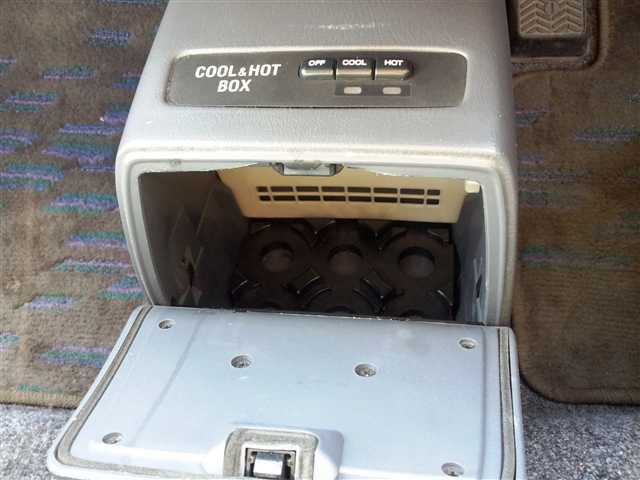 This is how my cool box sits in my van. While it is not actually cool box functional, I do love how it sits. The space inside is deceptively small. This thing looks like it could hold a lot, but I'm guess 3-4 cans of soda.. on top of each other. But the cool factor... 11 outta 10! Honestly, I didn't think I would EVER get a cool box. I was simply amazed to see one here in California!!! While for now, it sits more of a storage bin and less functional that the OEM trays, it is still rare to find these. While its function as an actual cool box is in op as of now, somewhere down the line, I will make the necessary changes to make it functional. Side note: The previa was a 1992. It didn't have the passenger side air bag. I was unable to get the driver side door open to look at the info and verify it, but I do believe it was a Canadian model. The body had tons of dents and make a slight collision on the driver side. But the major factor was underneath. The undercarriage was heavily rusted and many parts were crumbling and flaking. Awesome find never saw one before. 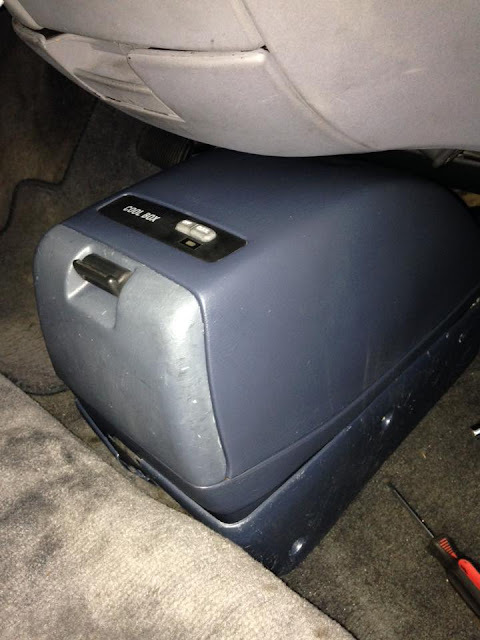 I just bought a 92 Previa with the Cool Box, it is pretty cool but the problem I'm facing is that I can't get to stock radio out because I can't remove the parts above with the cool box in the way. Any idea on how to work around this without actually removing the entire cool box? Seems kind of crazy just to get at the stereo. 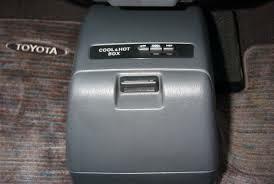 You shouldn't have to remove anything related to the cool box if you are taking the radio out. You will have to take the ash tray, coin compartment and cig lighter. I do have a video taking that stuff apart. Once you remove that stuff, start working your way towards the radio. 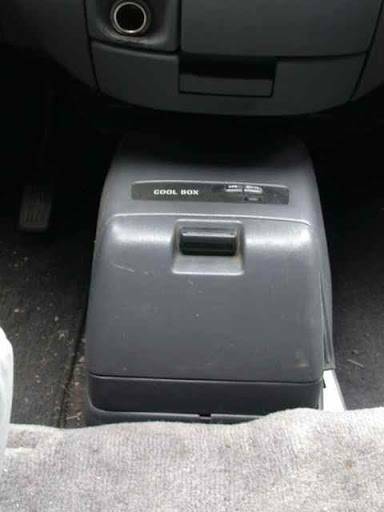 I have an aftermarket radio that came with it when I bought my previa, so I don't know if there are more steps if there is. The cooler itself was nicely powder coated and the color is nice. 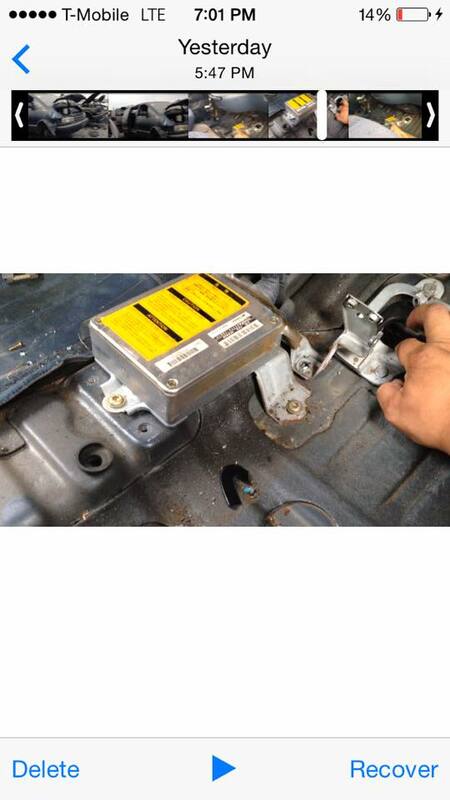 The hinges are good quality and attached well. The latch that closes the cooler is not very good quality and did not keep the cooler latched properly. I replaced the latch with a much better quality latch and it works great. Would have given 5 stars if not for the latch. 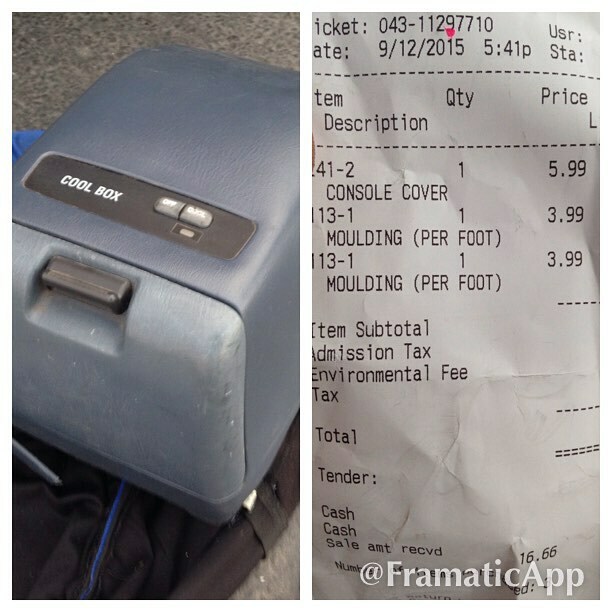 Size of the cooler is good for a day trip and will hold a 12 pack of cans. EGR system clean and Code P0401 This is another MUST DO on the previas, especially if you are having issues and code P0401 being thrown. 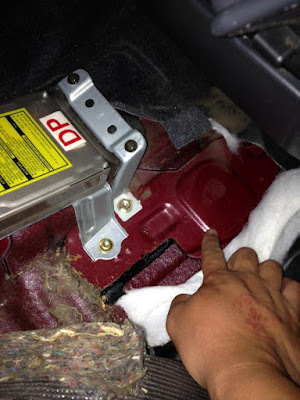 P0401 is "Exhaust Gas Recirculation flow insufficient detected". - EGR intake gasket - 25628-76010 - this is on the far right side next to the exhaust. - EGR valve gasket - 25627-76010 - used for the EGR valve to the intake manifold. -Air inlet duct gasket - 22273-76010 - this is where the air goes into the intake manifold and where the EGR port gets plugged. I did buy a set of crow's feet and Universal joints for the Exhaust pipe. I followed Zenseeker's photo's on every single detail. If you haven't visit his website (http://zenseeker.net/Previa/PreviaMaintenance.htm), it is a treasure trove of information!!! Zenseeker gets the credit and this would have been impossible for me to do without those pictures! **The pictures are located at the bottom of this post. These sources really put pictures and what they did out there.. so now I 'm going to jumble them all together as I am going to do these cleans soon! After spending a pretty penny and 2 months having the motor rebuilt. I kept reading about the black flakes in the coolant.. I mentioned this to the shop that I had my van worked on. At on point, I asked for the throttle body and IAC valve as it was just sitting there, but got the "dont worry about it, we'll take care of it". I even showed some blogs of that covered this issue. After getting the van back... boom, check engine light and the shop ran the code. In all honesty, I was kinda upset that they did not cover this part, even after I had mentioned it. My blogs about my various topics!